1834 Capped Bust Dime. Extremely Fine. 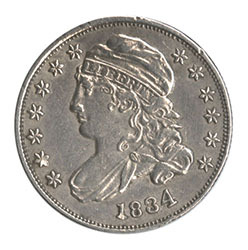 1830-1836 10¢ Bust Dimes. Lot of 6 coins, couple with scratches and one with hole, Inspect. 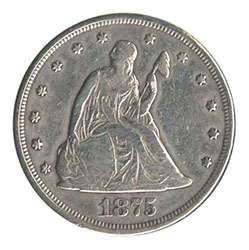 1867-S Liberty Seated Dime. Details of Very Good. Very slightly bent. 1839-1891 10¢ Seated Dimes. Lot of 24 coins, including 3 CC's, condition pretty nice for this issue, generally Very Good-Very Fine. 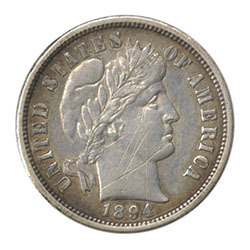 1894-O Barber Dime. Details of Extremely Fine. Light scratches on obverse. 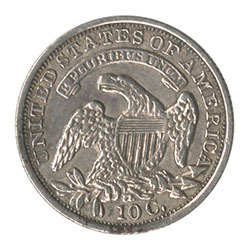 1892-1916 10¢ Barber Dimes. Lot of 26 mostly different, Good - Couple Extremely Fine. 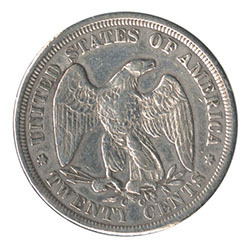 1875-CC Twenty Cents. Details of Very Good. Cleaned. 1875-S Twenty Cents. Details of Fine. Cleaned.